XLSX file should be in defined format. As workbook template can be used xlsx file from module directory “data/xlsx_template”, or install module and make export and edit downloaded file. Do not change the names of sheets. Do not change the order of columns. Not allowed characters in fields will be replaced during import. Category Tree: Name – required field. Each category must have a parent. Max. 128 chars. Example image – category ID 7 is without parent. Import will stop at row 13. Active = 1. Empty or 0 signify disabled category. Image – optional field. Only image name or URL. If is written only image name, should be uploaded into /nvn_excel_import/data/img_import/ directory using FTP client, or with upload button from module. Description – optional field, HTML tags allowed. ID Categories or Path. 0 or empty signify “Home” category. 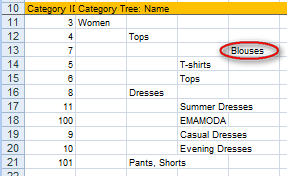 Use ID from “categories” sheet, separated by “ ; ” or full category path as text separated by “>”. First ID is used as default product category. Description, Short description – optional, HTML tags allowed. Tip – for better editing resize edit area in Your workbook. Tax rate – optional, number. Empty signify “No tax”. Price (tax excl. ), wholesale price – optional field, number. If empty – price is 0. Exact way, how to add combinations with values for each combination will be explained later. Exact way for combinations is used in export. EAN13, UPC, Reference Code, Supplier reference Code – optional fields. EAN13 and UPC are checked if valid. Reference Code, Supplier reference Code max 32 chars. Active = 1. If empty, is set to 0 = disabled. Condition – optional fields, only those values: ‘new‘,’used‘,’refurbished‘. Is set to ‘new‘ if empty. Visibility – optional fields, only those values: ‘both‘,’catalog‘,’search‘,’none‘. Is set to ‘both‘ if empty. Online only = 1. If empty, is set to 0. Available for Ord. = 1. If empty, is set to 0. Custom fields – optional field. Custom filed name>type>required. Type 0 = “File field”, Type 1 = “Text field”. Required 0 = not regiured, 1 = reqiured field. On Sale = 1. If empty, is set to 0 = disabled. Add shipping cost – If empty, is set to 0. Copyright © 2019 PRAOTEC.COM. All Rights Reserved. Member of NetViaNet.com group.